The news isn't that the tests failed, but rather that these countries are working on these weapons. 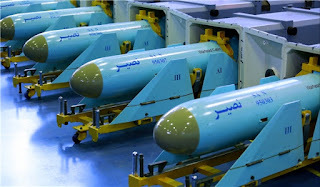 Iran attempted an unsuccessful test launch on Tuesday of a cruise missile from a submarine in the strategic Strait of Hormuz. Two US officials told Fox News that an Iranian Yono-class “midget” submarine conducted the missile launch, but the test failed. North Korea is the only other country that operates this kind of sub, according to the report. The report did not detail the size or range of the missile or its warhead payload. Last month, Iran’s navy deployed new anti-ship missiles, called Nasir, boasting that they could be fired from land or ship-based launchers. The cruise missile was test fired during the “Velayat 95” Iranian military drills in the Persian Gulf in February. An attempted missile launch by North Korea on Sunday failed, US and South Korean defense officials told CNN. The attempted launch occurred a day after the regime of Kim Jong Un showed off a bevy of new missiles and launchers at a large-scale military parade on its most important holiday. A South Korean defense official said the action took place in Sinpo, a port city in eastern North Korea. That was the site of a ballistic missile test earlier this month in which the projectile fell into the Sea of Japan, also known as the East Sea.